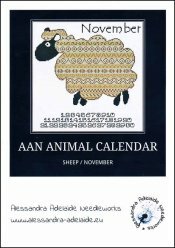 AAN Animal Calendar: November Sheep [W5465] - $13.44 : Yarn Tree, Your wholesale source for cross stitch supplies. Cross stitch pattern by Alessandra Adelaide Needleworks. "Baaahhhhhh" look who has walked in on November. He is on a mission, so get him stitched before you fall asleep & start counting sheep. "Stitch count is 150 x 150.